Wining and dining is an essential part of travel, and the meals you enjoy can be some of the most lasting memories you’ll take from your trip. Some restaurants have managed to suture the dining experience to the landscape in remarkable ways: perched on precipices, tucked into prehistoric caves, or soaring high above the city on impossibly high skyscrapers, the experience becomes a feast for all the senses. If you want to spice up your meals with an extraordinary view, try any of these 10 restaurants with insanely beautiful views. 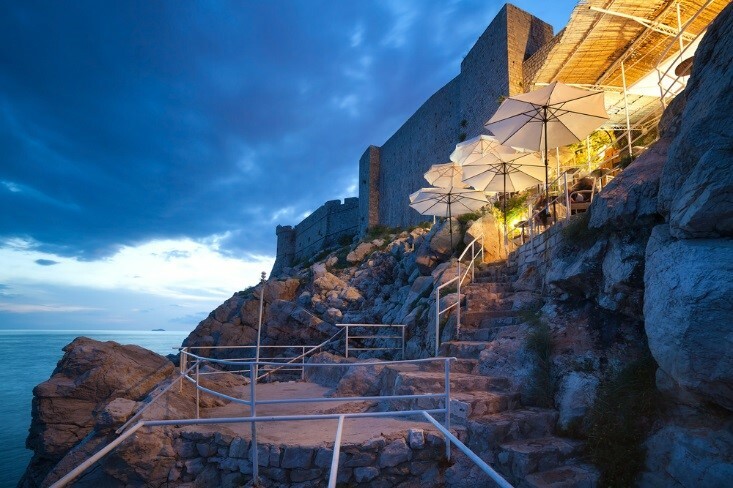 The Buza Bar in Croatia’s capital is built right into the city’s ancient stone walls – you have to walk through the “hole in the wall” to get to the strip of café tables that hang on the side of a sheer rocky cliff. The big draw is the uninterrupted view of the impossibly blue Adriatic Sea, but when the rocky pathways are lit up in the evening, there’s a pretty magical ambiance on shore, too. Ever wanted to dine in rainbows? 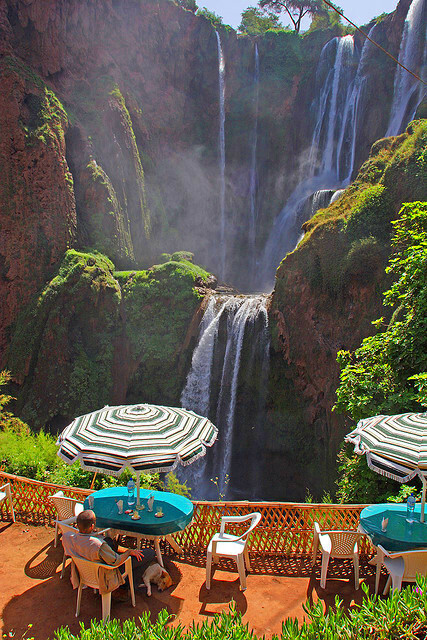 These falls in the Atlas Mountains of Morocco send up misty plumes that can set the stage for a colorful display, although the view from the adjacent café is still stunning on rainbow-free days. Monkeys hop and play in the trees, the water crashes down below, and the sunny patio crests the rocky cliffs – what more could you ask for in a tropical oasis? Under the thatched roof of the Dasheene restaurant at Ladera Resort you can kick back and admire the jaw-dropping views of Piton Mountains rising up from the sea and tropical forests tumbling down in all directions. The menu stands up to the scenery, too: loaded with fresh fish and local produce, you won’t regret stopping for a bright, casual lunch or a romantic dinner under the setting sun. Skiing may be the defining activity in Chamonix’s snow-covered mountains, but it’s not a prerequisite for a breathtaking lunch at the summit of Brévent. Take the impressively steep cable car ride up the peak, and wander out to the sun-filled patio. 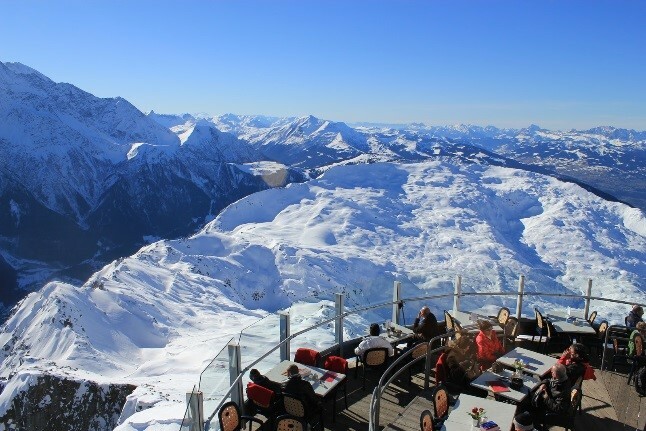 Whether it’s the winter or the summer, the tables are in high demand (but you can reserve a spot before you get there), given the panoramic view of Mont Blanc and the surrounding Alps. 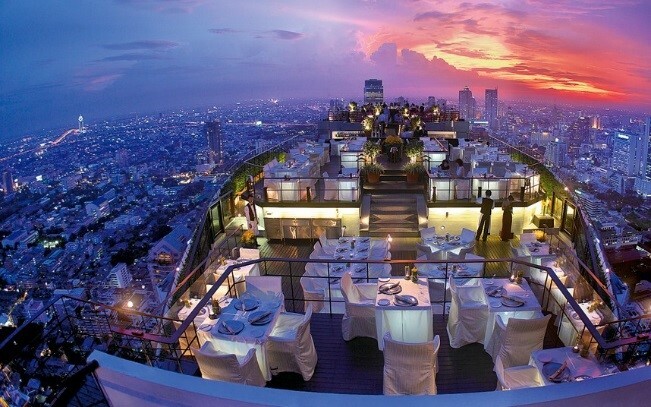 Perched over Bangkok’s illuminated cityscape, Sirocco is the height of urban dining – in every sense of the phrase. Take the elevator up to the 63rd floor of the State Tower to the world’s highest open air restaurant, complete with a finely dressed dining space and a cocktail bar skirting the edge of the roof. You won’t find any authentic Thai cuisine on the menu – this is a modern take on Mediterranean fare – but the chef’s delightful creations are almost as impressive as the view. 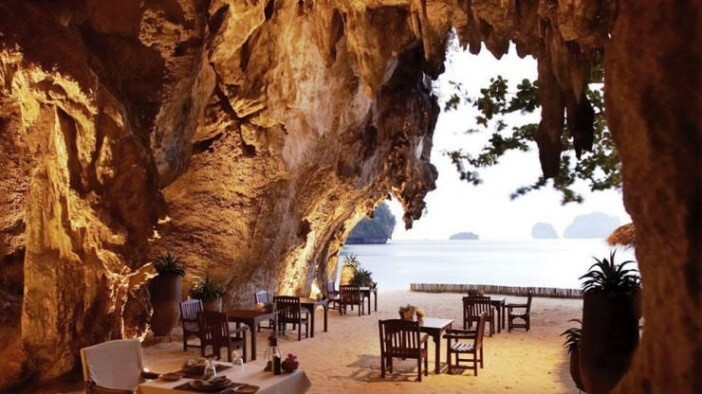 Tucked into a limestone cave on isolated Phranang Beach, The Grotto is the crown jewel of the renowned Rayavadee Resort. After taking a boat across from Krabi town, diners are treated to a delectable seafood barbecue in the peaceful cavern, where every seat has a clear view of the bay beyond. Luckily, it’s not reserved for resort guests – anybody can make a reservation to dine in the intimate atmosphere. The restaurant’s name describes the spot perfectly: El Farallon, or “a rock that comes out of the ocean”. It’s the most renowned restaurant in the region, not only for its shockingly fresh seafood, but also for the million-dollar view of the neighbouring Pacific. Guests sit around a cozy patio, lit by candlelight and backed by the Champagne Terrace, where you can choose one of 15 champagnes to complement your evening. Niagara Falls is an impressive force of nature, and while the power and beauty can be appreciated from the ground, there’s nothing quite like seeing the massive waterfall from above. 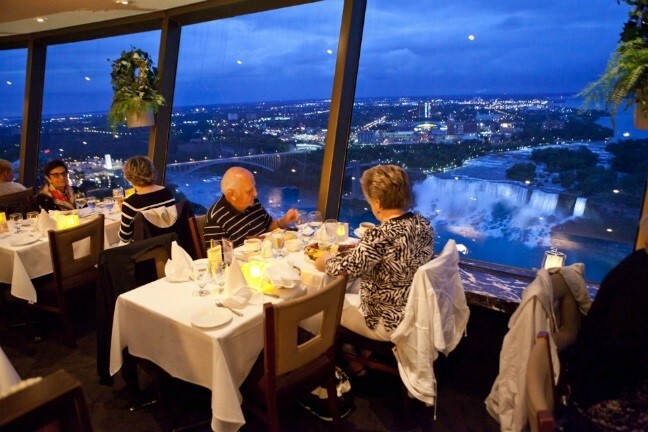 In the nearby Skylon tower, you can take a table by the window to enjoy your dinner with the falls at your feet – and the rest of Niagara in your ever-changing view. Lunchtime offers a bright and broad view of the area, while dinner guests will enjoy the illuminated falls and cityscape, and on some nights, fireworks. 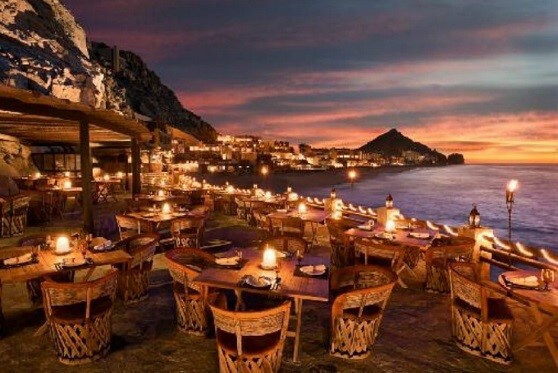 Sitting on stilts at the top of a cliff, Sierra Mar is a uniquelyappealing dining experience. The view is incredible, especially as the sun dips down under the horizon, but the award winning fare is equally tempting. An adventurous menu and world-renowned wine cellar will top off your relaxing evening with the California ocean vista. 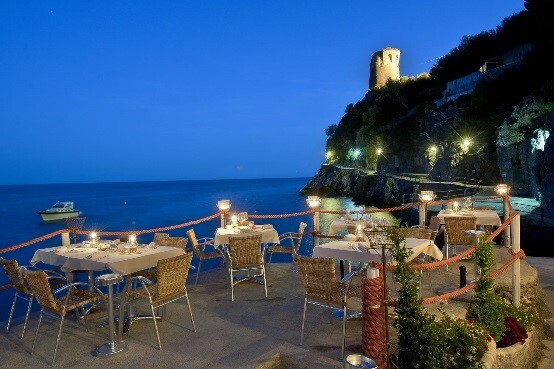 The Amalfi Coast has no shortage of amazing natural scenery, so it’s fitting that a restaurant has carved a spot into the rocky coastline with a patio and lounge space to take in all the beauty. Not surprisingly, their seafood is the star of the menu, from the catch of the day to the legendary sea urchin linguine. The understated deck offers a perfectly romantic ambiance that you won’t soon forget. World-renowned restaurants and bargains don’t typically go hand-in-hand. Beautiful views bring a pricier menu, but when tables on the tourist track already cost you more than they’re worth, why not dish out a little extra for a truly formidable evening?